/Photo by Laslovarga via Wikimedia Commons under Creative Commons Attribution-Share Alike 3.0 Unported license. The National Weather Service has issued a winter weather advisory for an area of Wisconsin that includes Kenosha County. The advisory is set to be in effect from 6 p.m., Tuesday to 6 a.m., Wednesday. The major concern with this advisory is “freezing rain, sleet and snow” causing slippery road conditions. 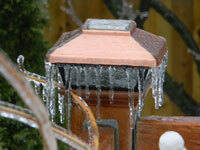 As much as .1 of an inch of ice may accumulate. The latest, local NWS forecast says there’s a 90 percent of that mixed bag of precipitation during the advisory period. Freezing rain or rain or a mix may persist through Wednesday and Wednesday night until giving way to straight rain on Thursday.